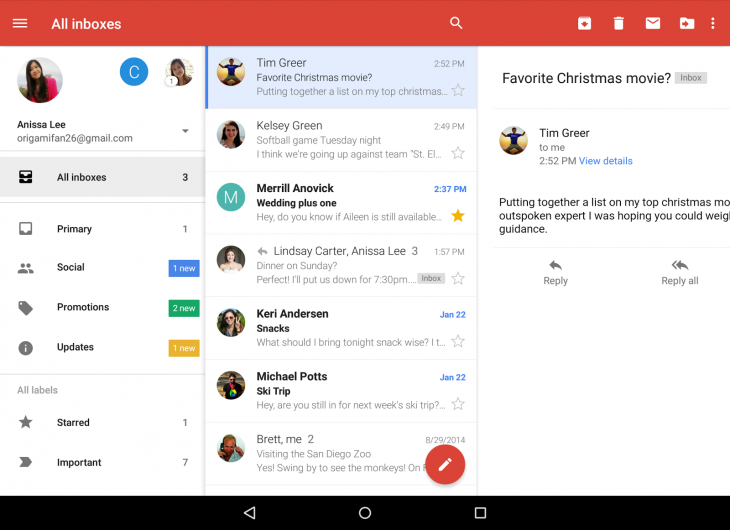 Google is unleashing a significant update to its Android Gmail app today that should please users with several email accounts. You can now view emails from all your different accounts in one spot with a new “All inboxes” option. This lets you respond to all of your messages without needing to manually switch between account, whether it’s a Gmail account or not. Gmail’s conversation view makes sorting through long email threads easier, but it’s previously only been available for gmail.com addresses. Now any IMAP/POP accounts are getting the feature too, so your Outlook conversations will look just as organized as your Gmail ones. Otherwise, there are a few minor updates. Search has been improved with smarter autocompete, while animations have been made more responsive and attachments now show a larger preview. The updated app should be rolling out to users everywhere today. No word on the features coming to iOS yet, but we’ll update this post if we find out more.